Plaza Cleaners has been dry cleaning and laundering clothes in Paso Robles for almost 20 years. We are a family owned and operated small business. We raised our family in this community and we have watched many others raise theirs as well. We are proud of this community and feel grateful of the opportunities we have to give back. One way is through “Coats for Kids”. For us what makes Coats for Kids so special is that it is a very hands-on personal way to support our community. It is more than just a monetary donation or a one day event. For more than a month Plaza Cleaners is able to donate our time, energy, and know how. We’re very fortunate to be able to really get involved at the ground level and see how generous Paso Robles can be and how appreciative the recipients truly are at the end of year. 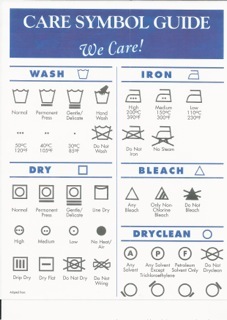 By law, all garments are required to have a care label indicating the method (or lack thereof) that the garment can be cleaned. These instructions must ensure that when followed, they will cause no harm to garment. The instructions must also warn about certain procedures that may cause harm. Some garments, no matter how expensive, have care labels that are incorrect. Usually this occurs when a garment is assembled from different materials ~ one material matches the care label while the other does not. Some care labels are very specific. Plaza Cleaners is one of the very few cleaners around to offer all of the following serves in addition to normal dry cleaning and laundry. Often times care labels offer only one method of cleaning while the garment may easily be cleaned by other methods. At Plaza Cleaners we know the appropriate techniques and when to use them.